After an extensive beta test, The Division 2 has finally launched. All versions are available for testing and the overall impression is that, similar to its first title, Ubisoft Massive has handed in a successful multi-platform project - accomplished all on all consoles, with PC once again delivering a huge suite of options. It's been three years since the original launch of The Division; technology has evolved with the sequel, and Massive still delivers a pleasantly clean and crisp look to the game, with Xbox One X operating at native 4K - 3840x2160 - a significant achievement for this advanced engine. Dynamic resolution scaling is a feature of the Snowdrop engine and was deployed in the first game, but despite a number of sample tests, everything we looked at here presents at a full ultra HD pixel count. Perhaps it kicks in during heavier scenes we've not witnessed yet, but so far, everything effectively points to a native 4K release. As you might expect, PlayStation 4 Pro doesn't quite match the X, with the developer deploying both DRS and temporal anti-aliasing in delivering its 4K output mode. Our sample range witnessed 3456x1944 at the top-end, dropping to a recorded minimum of 2458x1382. A reconstruction technique appears to blend in visual data from previous frames, so with static scenes in particular, Pro looks remarkably similar to its X counterpart. In motion, the effect isn't always successful, but it's clear the technique has more benefits than drawbacks, with the TAA working well in addressing most aliasing issues. 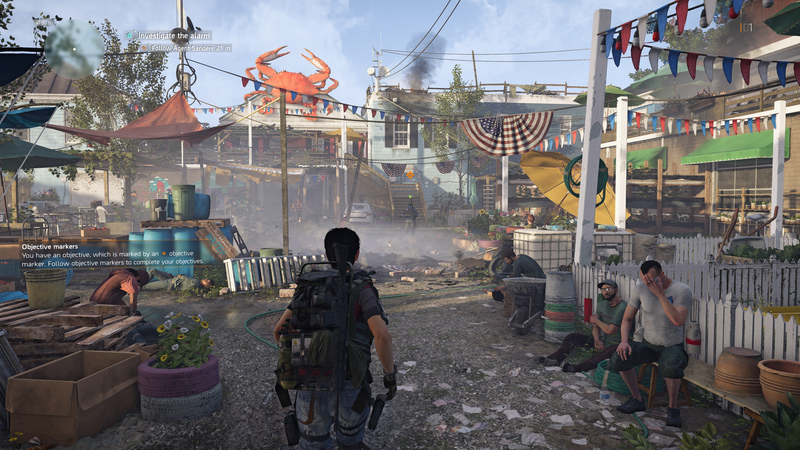 We say most, because pretty much any flavour of TAA has a side-effect and The Division 2 is no exception: it's hard to overlook the banding on movements in this case - especially across your gun as you turn from a light area to dark, or any motion across fine detailing like fences. You'll notice it from time to time, but on balance it's a positive influence on the final image. Addressing the base consoles is a lot easier. 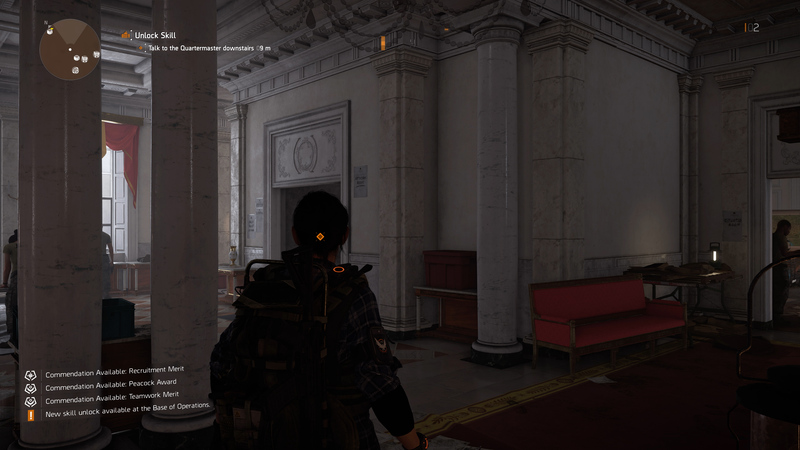 The standard PS4 runs flat-out at 1920x1080 natively with no noticeable drops underneath. 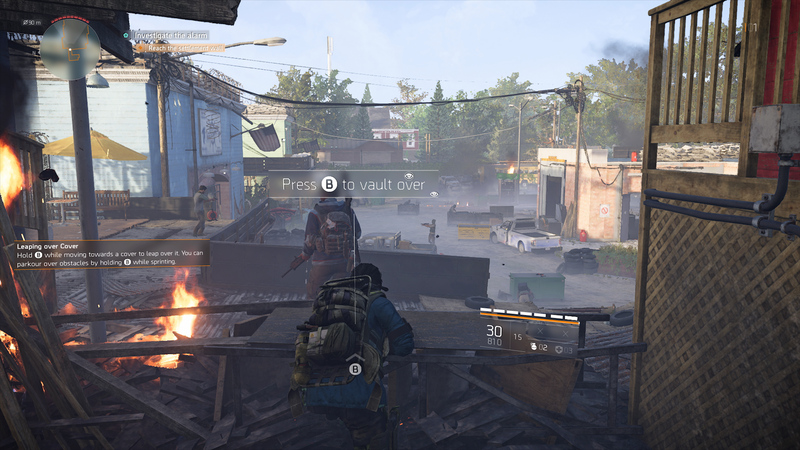 It's the vanilla Xbox One that's the more challenged of the two, as you might expect, but it holds its own at 1080p quite nicely, but similar to the first Division, dynamic resolution scaling is in place. For example, the opening tutorial firefight, with lots of fire and smoke, brings resolution down to 1664x936 according to one of our samples - so just above 900p. That's the worst on record found so far, but on average the pixel count is higher and the presentation holds up. All systems tested - a detailed video breakdown of The Division 2. The Snowdrop engine impressed us in the original Division, and it continues to shine in certain respects with the sequel. That said, the presentation does have some polish issues - aspects we believe can be resolved in future patch updates. Addressing the positives first, the reflections are beautiful from pretty much the first frame of actual gameplay. You get a convincing use of screen-space reflections and cube-mapping - or in other words, a blend of real-time processing of a scene, and offline rendered textures. In puddles, it reflects all enemies and objects within a camera's view, and it does so on all consoles. Sadly reflections don't include alpha transparencies, like explosions, but any light sources or geometry are covered in the mirror image. It's put there, front and centre in the mission outside the White House. In many ways this is Massive showing off its new Snowdrop feature set in a contained space, including the new tall grass, which sways around the player as you walk through dense patches. Water rendering is also standout for the sequel, with ripples realistically forming around your body as you wade through a fountain, with gunfire also interacting realistically with the surface. This isn't just a one-off included for effect: water bodies are strewn across every area - right down to the mossy puddles on the streets outside. Every console gets these upgrades, even the base Xbox One - although there is a drop in resolution on both base machines. A lot is inherited from the original game too. A crisp, clean volumetric effect is used for mist and smoke, less notably than the first game with its snowed over New York, but still, it's a tool in the box for later levels. A look at the PC version settings puts into perspective how many features are at the team's fingertips. These are all parameters that can change per platform, and it's a respectable showing. In my testing, the quality of volumetrics on console is like-for-like, and you won't notice any major drop-off for the base machines - but it does lag behind PC. It's the same situation with the god ray - or crepuscular ray - effect from sunlight, though all consoles get subsurface scattering for skin. Nips and tucks across systems are carefully managed, and the sense is of a great-looking experience on all systems. But then there are the polish issues. Texture and object pop-in are a bigger distraction than I'd expected - something I saw in the beta and hoped would be fixed by now. 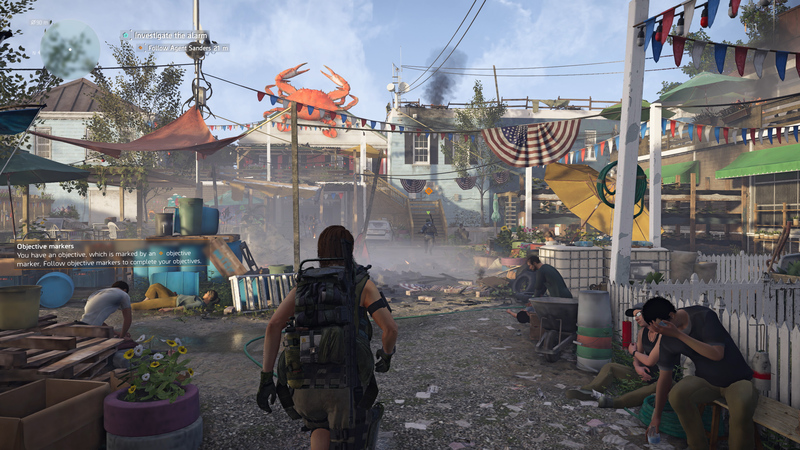 It's all the more glaring, because The Division 2's world design should be the star of the show. The density of detail strewn across the environments is impressive, and opens up some great combat options. Add in the changing time of day and variable weather, and clearly, there's a lot of variety here. But the frequency that you see low-res textures appear on billboards and posters is just too high right now. It takes too long for the proper, high-res asset to load in, and it breaks the illusion Massive's attempting to prop up. This pop-in affects every console, and on PS4 Pro, I even tried to mitigate the trouble by offloading the game onto external storage - to no real success. Whatever changes need to be made have to come from the developer itself. After all, the PC version doesn't have the issue to the same extent, although likely helped along by running straight from an SSD, which isn't a standard option on the consoles. 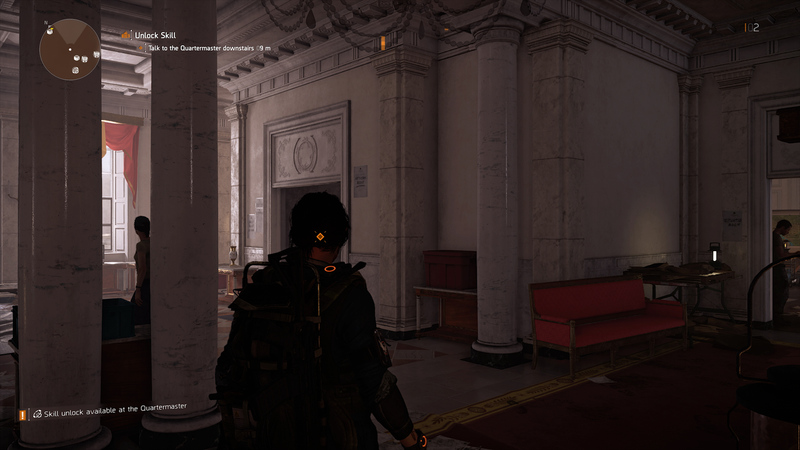 The Division 2 compared on every machine. PC and Xbox One X take point at a native 3840x2160, while PS4 Pro runs at highest on record at 3456x1944 - with dynamic adjustments under that. PS4 and Xbox One run at 1920x1080 apiece, but with scaling under that on Microsoft's base console. Let's look at the enhanced machines next, compared to PC. Texture and object streaming lag behind even on X and Pro - as seen on the texture-less tires to the left - while PC runs without any noticeable issue. Shadow quality, volumetric effects, and ambient occlusion are improved on PC, while object LODs run at a higher preset. Core asset-work is otherwise identical between platforms - though X does get 8K textures for skies. A final shot to show minute detail changes between base Xbox One and X. Ambient occlusion differs, as does terrain detail on pillars straight ahead. Discrepancies in texture pop-in aside, all versions of the game are very close indeed asset-wise. This actually raises a curious point when you look at install sizes though. Bizarrely, the PC and Xbox One versions take up a 43GB install, but the PS4 and Pro editions take a whopping 89GB of space on the hard drive. We know the game demands a 50GB day one patch, but it appears Xbox devices integrate this into the main install after downloading - while PlayStation systems stack it on top of the base 43GB install. Either way, it's strange, and right now leaves a much larger HDD footprint on PS4 systems. The final nitpick is gameplay-based. The AI is meant to be more varied for the sequel, but in my experience, it needs some work. Enemy AI sometimes makes erratic, and just plain goofy decisions right in front of you - again breaking the sense of realism. During my testing in the main base area, you can catch NPCs floating about, walking then shooting up to the sky as they scale staircases. It's very strange, and on top of the streaming issues it makes the whole affair feel a little rough around the edges. After all this time waiting for the sequel, I did expect a little more polish this time - but in fairness, it's nothing that can't be patched. 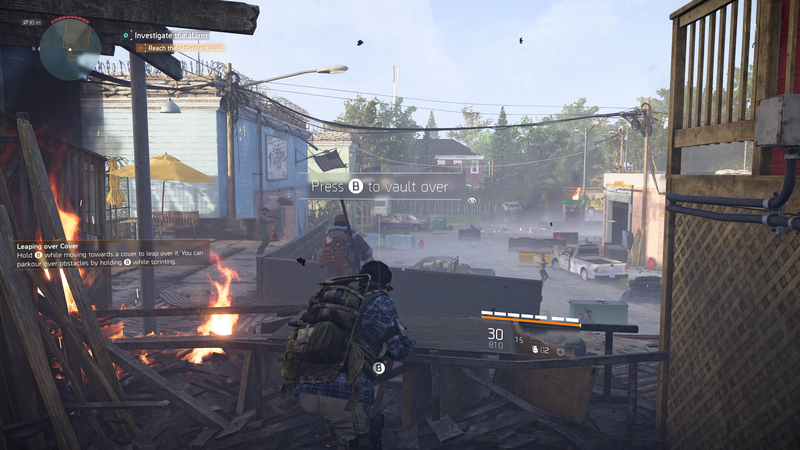 So, resolution apart, just how close is The Division 2 across all systems? The most interesting side-by-side is between the extremes: base Xbox One and the X model. Really this gives us the best look at the spectrum of what's possible on consoles, but really, it's the 4K vs 1080p comparison that sticks out most obviously. 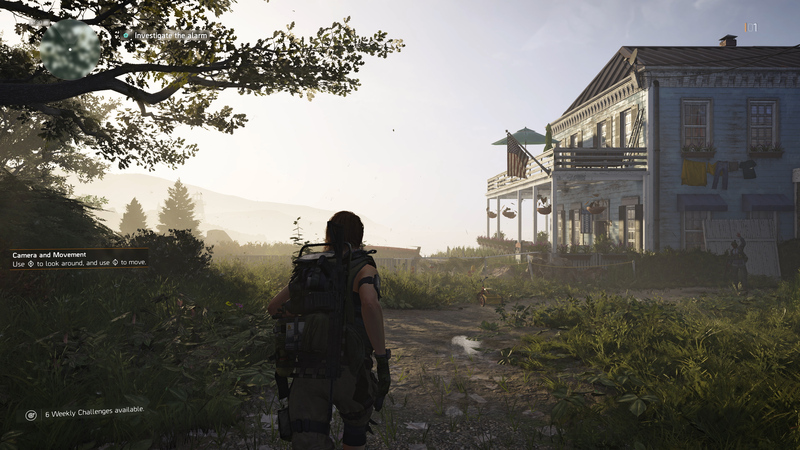 According to Xbox Wire, X has a few enhancements over the top, including 8K textures for skies but general texture work is on par once it loads in. At the very least, mapping for skyboxes and clouds should show a subtle upgrade. Looking elsewhere you also have improvements to overall object draw distance - though again it's subtle. There's a difference in reflection quality between the two as well, and overlooking the weather changes, there's an upgrade in the resolution of the reflection mapping. Shadow resolution is identical - typically it's the setting that takes a lion's share of processing power, but it's a shame there's no way to divide the consoles here. The same goes for PS4 and Pro; the stair-stepping and dithering on real-time shadows on walls, and also the ambient occlusion effect, are indistinguishable between platforms. It's not a great look overall, and above all else, I wish X or Pro at least could have gotten a much better setting. Before The Division 2, Ubisoft Massive enhanced its debut release for PS4 Pro and then Xbox One X - here's how that panned out. 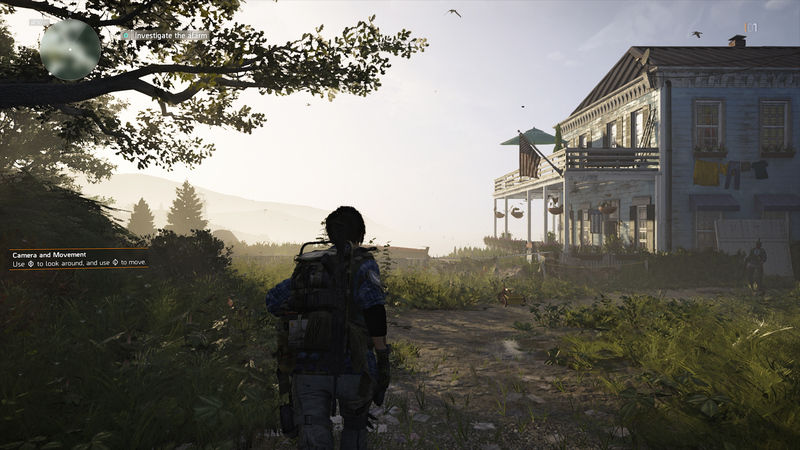 The PS4 and Pro comparison show much the same thing; the overall quality of terrain and textures and effects stands in place, and it's the resolution that's scaling, and making the most of the extra GPU headroom. A lot of the best upgrades are of course found on PC. Firstly, yes, the texture streaming issue is largely minimised or removed, and equally, ambient occlusion at max settings gives us far less dithering on the plants ahead. Even shadow maps from range are higher quality too, though the improvement is not radical. The volumetric lighting- notably on light shafts - also runs at a higher resolution overall. One major aspect here that consoles clearly miss out on is the capacity for 60fps gameplay - and jumping to PC running at 1080p reveals that the experience is vastly improved at higher frame-rates. However, PC has its own range of stability and freezing issues that can be frustrating. Just like the first game, 30fps is the performance target for the consoles and it's an almost solid lock on most systems. Xbox One X is obviously getting a great deal with its native 4K, but performance wise it's no slouch either - 30fps locked in every place I've tested. Given it's rarely engaging dynamic res so far (if at all), it does suggest it's not being pushed beyond its limits here. Next along is PS4 Pro, which saw most of our play time with random allies. Performance-wise, the turnout again is much the same: 30fps with v-sync. Potentially there's scope for screen-tearing, but we simply haven't seen it so far. It seems like wherever there's any real struggle with effects-work on-screen, Pro drops its resolution rather than taking a frame-rate hit - to under 1944p - which is the preference. PS4 again shows we're looking at another 30fps line all the way through. Its counterpart, the base Xbox One S, has been dealt a rough hand with multi-platform products this year, but The Division 2 holds up nicely enough. It's not as solid as the PlayStation 4 version, and there is the sense that performance demands exceed the dynamic res window sometimes. You'll spot the screen tearing in half at points, mainly in the face of long roads filled with smoke or toxic haze effects. It's nothing to egregious, but a sign that this system feels the pressure when too much firepower gets unloaded in one spot. That's the general turnout then. 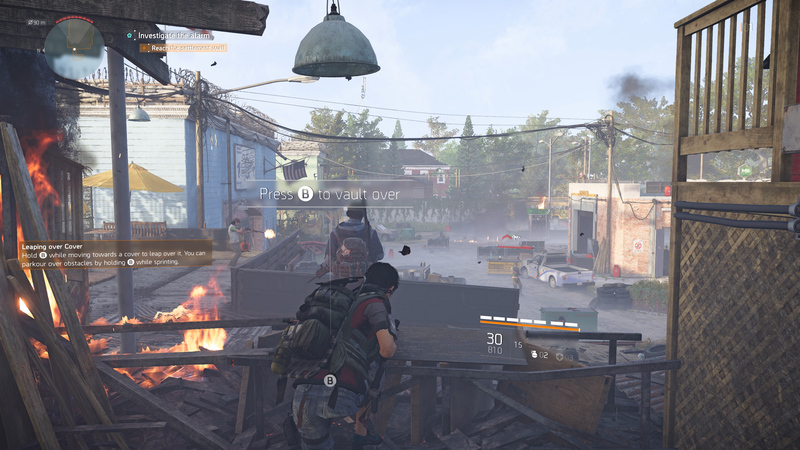 The Division 2's more of an iteration than an evolutionary leap over the first game - something I expected going in, but I did find myself wanting a more radical overhaul, even on PC. For now, the improved vegetation, water and quality reflections are nice touches at least. And, combined with the volumetric lighting that made the first game a marvel to look at, it's good-looking package overall. The only real downside right now is the unusual AI, and pop-in on textures on console. 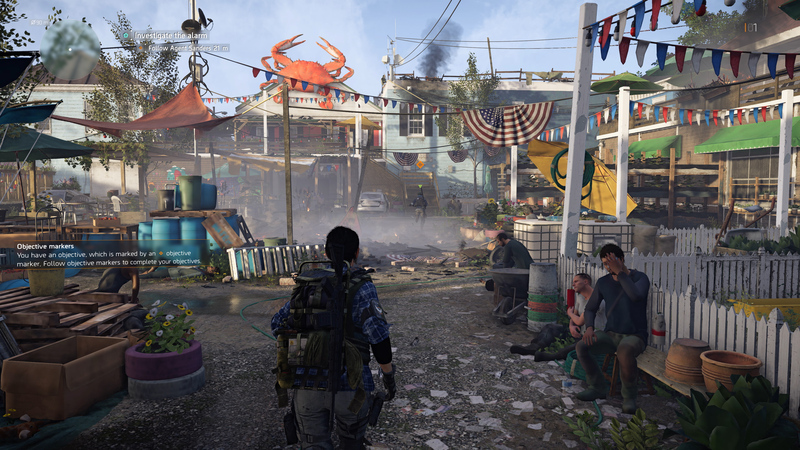 If you look past that, there's some highlights in visual direction, and the hook of its four-man squad shooting and looting is as strong as ever.